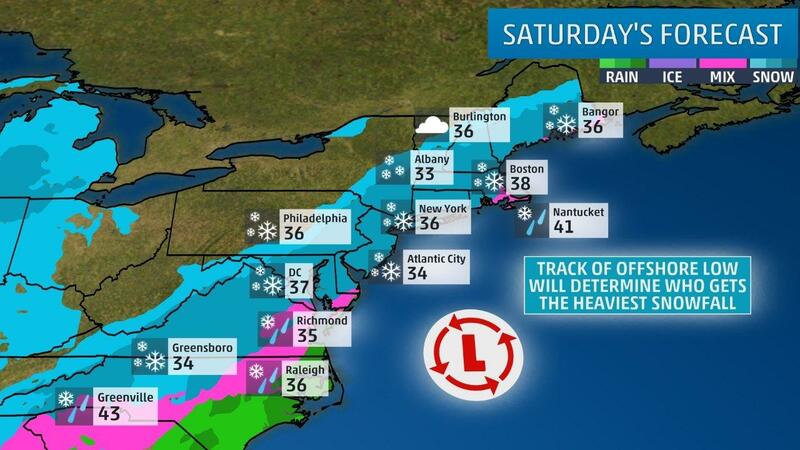 Winter Storm Benji's snow will turn its focus to the East Saturday and Saturday night. Winter Storm Benji will spread snow to much of the Northeast Seaboard Saturday, after blanketing a swath of the South with record-setting snowfall. By the time Benji departs the Northeast, it will have laid down a blanket of snow 2,000 miles long from Texas to New England. Already over 250,000 customers have lost power in the storm and roads remain treacherous in parts of the South. The most solid area of snow, for now, remains in the Southeast. This is the impulse that will eventually bring the most concentrated stripe of snow to the Northeast Saturday. Mobile, Alabama, picked up 1 inch of snow Friday night, their first one-inch snow event since Jan. 28, 2014. Meanwhile, the snow continues in parts of eastern Alabama, Georgia, and the southern Appalachians. Much of the north and northwest sides of the Atlanta metro area picked up 5 to as much as 10 inches of snow. Ten inches of snow has also been measured near Anniston, Alabama, with snow continuing early Saturday morning. 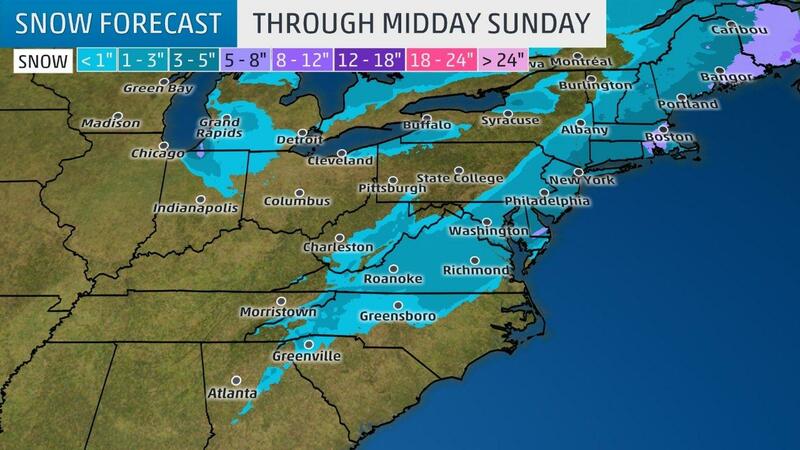 Over a foot of snow has fallen in the mountains of North Carolina, topped by an estimated 18 inches near Cashiers. Over 8 inches has piled up in Asheville, with snow continuing. Just under 2 inches has been recorded in Greenville-Spartanburg, South Carolina. Parts of southwest Virginia have picked up 2 to 5 inches of snow, so far, with snow still falling. 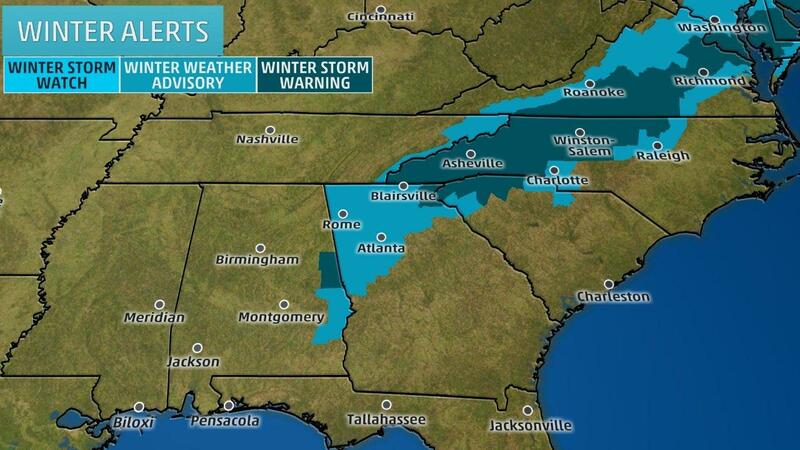 Winter storm warnings continue in parts of Alabama, north Georgia, upstate South Carolina, western North Carolina and a sizable swath of Virginia. This includes the cities of Greenville-Spartanburg, Asheville, Greensboro, and Richmond. In the South, the National Weather Service has issued winter weather advisories stretching from the western Florida panhandle to Virginia, including the cities of Montgomery, Atlanta, Charlotte and Raleigh. 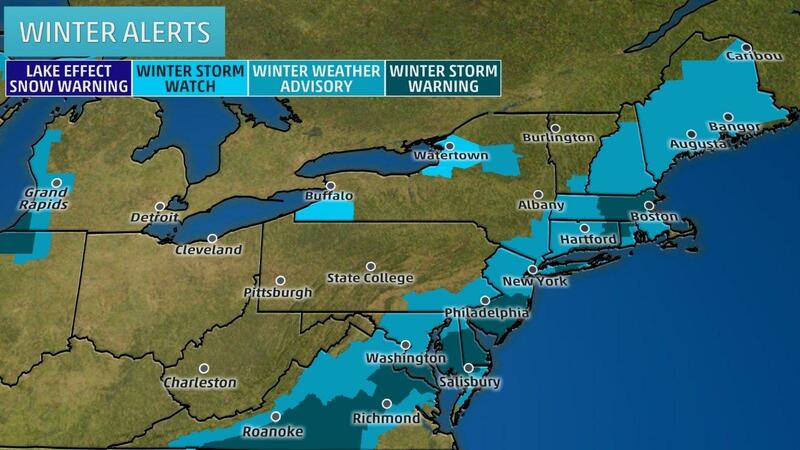 In the Northeast and mid-Atlantic states, winter storm warnings are in effect from parts of Virginia to Massachusetts, including Boston, parts of Long Island and southern New Jersey, the Delmarva Peninsula and southern Maryland. These warnings do not include Philadelphia, Washington D.C. or New York City at this time, but upgrades are possible. Winter weather advisories have been issued from Maine to northern Virginia, including the entire New York, Philadelphia, Baltimore, and Washington D.C. metro areas. Travel will be hazardous in these areas. Snow will taper off Saturday morning in the western Florida panhandle, Alabama, Georgia, east Tennessee and upstate South Carolina. Snow may persist much of the day in parts of western and northern North Carolina, Virginia and the mountains of West Virginia. In the Northeast, a broad area of snow will spread northward through the day, from the mid-Atlantic states to New England, as low pressure off the East Coast gains a more intensity. By afternoon, most of the I-95 corridor from Maine to Virginia will see snow. 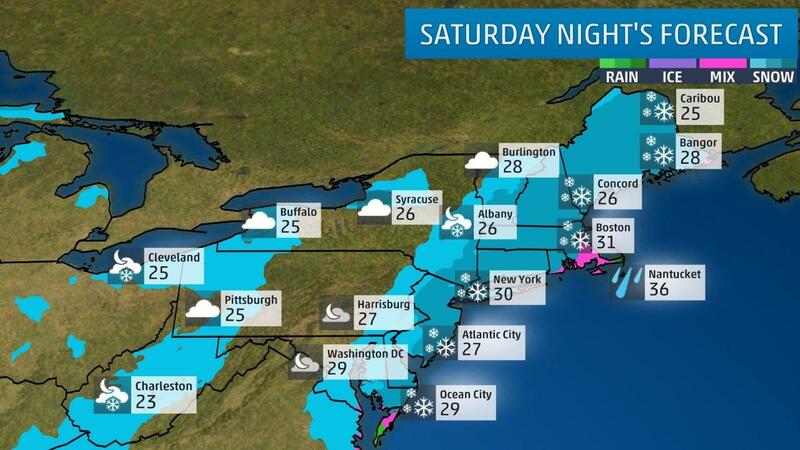 Saturday night, the snow will gradually taper off from the Hudson Valley of New York and New Jersey south and west. Moderate to locally heavy snow will continue in New England all night. Some lingering snow may hang in parts of northern New England early Sunday morning before the intensifying system finally departs into eastern Canada. Additional snowfall of around one inch or less is possible early Saturday in parts of Alabama and Georgia. 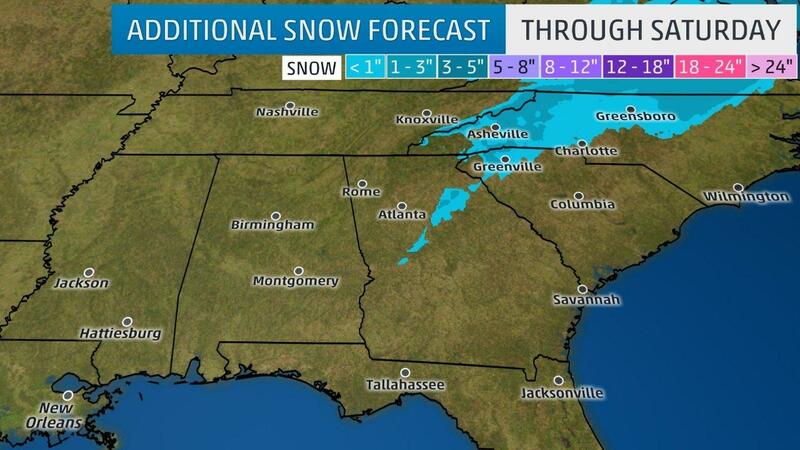 Parts of upstate South Carolina, North Carolina and Virginia may pick up another 3 inches or so of snow. While temperatures may rise above freezing Saturday, lows Sunday morning in the 20s in many of these areas may lead to any stretches of roads with residual water from the day's melting snow refreezing, especially on bridges and overpasses. Extreme caution is advised if you must travel in these areas. In general, a swath from Virginia to New England should pick up anywhere from 2 to 6 inches of snow through Sunday morning. However, some higher totals are possible from southern Virginia to the Delmarva Peninsula, southern New Jersey, and parts of eastern New England. 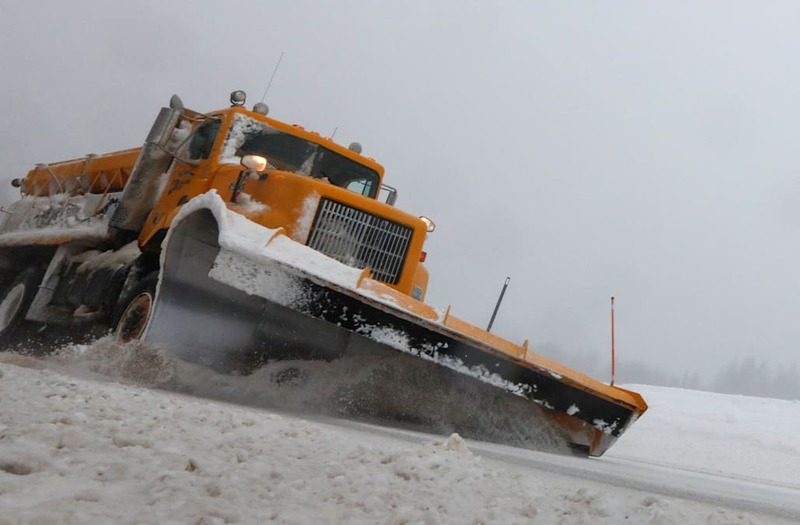 Fight delays, perhaps cancellations, can be expected Saturday at the major airport hubs, including all three New York City metro airports, Boston, Philadelphia, and Washington-Dulles. The first snow from Benji came near America's border with Mexico. Snow fell on the morning of Thursday, Dec. 7 in portions of western Texas, which spread east into the Texas Big Bend and the Rio Grande Valley, including Laredo and Fort Stockton. More than six inches of snow fell in some of the more mountainous terrain of the Texas Big Bend. In central Texas, 1 to 2 inches of snow fell Thursday night along the Austin-San Antonio corridor. Four inches of snow accumulated in Dime Box, Texas, east of Austin. College Station's Easterwood Field measured 5 inches of snow Thursday, their heaviest calendar-day snow on record. They had never previously reported measurable snow in December in records dating to 1951. However, a cooperative station 6 miles southwest of College Station reported a 6-inch snowfall on Jan. 30, 1949, as well as previous December measurable snow events on Dec. 11, 1945 (0.5 inch), Dec. 20-21, 1929 (5.5 inches total), Dec. 21, 1927 (0.5 inch), and Dec. 9, 1898 (0.5 inch). Amazingly, 0.3 inches of snow fell in Brownsville, Texas, which tied a 135-year-old record low temperature for Dec. 8 by dropping down to 34 degrees. Thundersnow with 1 inch-per-hour snowfall rates was observed in Corpus Christi, Texas, early Friday morning, their first measurable snow event since the infamous Christmas 2004 event. Up to 7 inches of snow had been measured on elevated surfaces in parts of the city. Rockport, Texas, site Harvey's Category 4 landfall just over three months ago, reported up to 3 inches of snow Friday morning. Much of the Houston metro area picked up 1 to 2 inches of snow, blanketing the grass on the city's west and northwest sides, the metro's first measurable snow event in over eight years. Freeway flyover and some bridges became icy Friday morning. Finally, Beaumont-Port Arthur, Texas, ravaged by flooding from Hurricane Harvey, picked up 3 inches of snow. Around 6.5 inches has stuck in Kentwood, Louisiana, or 50 miles northeast of Baton Rouge. Snow also blanketed Baton Rouge, with a total of 3.5 inches, for the first time since December 2009. Much of southwestern Mississippi has picked up 4-7 inches of snow, including 7.0 inches in Bay Springs. Jackson picked up 5.1 inches of snow, Meridian came in with 5 inches, and Hattiesburg picked up 4.1 inches. Snow was also seen along the Mississippi Gulf Coast in Gulfport, Bay St. Louis, and Pass Christian. Two locations, one near Anniston, the other near Foster's Crossroads, picked up 10 inches of snow. Up to 5 inches of snow had been measured at the National Weather Service office near Birmingham, and Tuscaloosa measured 1.5 inches. Twenty Alabama counties urged residents to use extreme caution on roads due to icy conditions. Icy roads were reported in numerous parts of Calhoun County. All roads in the city of Talladega were closed for a time on December 8. The north and northwest sides of the Atlanta metro area were clobbered by 5 to 10 inches of snow, in a swath from Paulding and northwest Cobb Counties into Bartow, Cherokee and parts of north Fulton Counties. With more rain than snow, Atlanta's Hartsfield-Jackson International Airport on the city's southwest side only measured 0.8 inch of snow on December 8. As mentioned earlier, up to 18 inches of snow had already fallen in the mountains of western North Carolina near Cashiers. Other locations picking up more than 10 inches included Highlands (15 inches), Maggie Valley (12 inches), Brevard (10.5 inches) and Hendersonville (10 inches). Elsewhere, Greensboro picked up 1.8 inches, Raleigh-Durham a mere 0.3 inch, and Charlotte Douglas International Airport only managed a trace of snow.